The Tibetan Terrier is a strong, medium-sized dog who is often hidden beneath their ample coat. 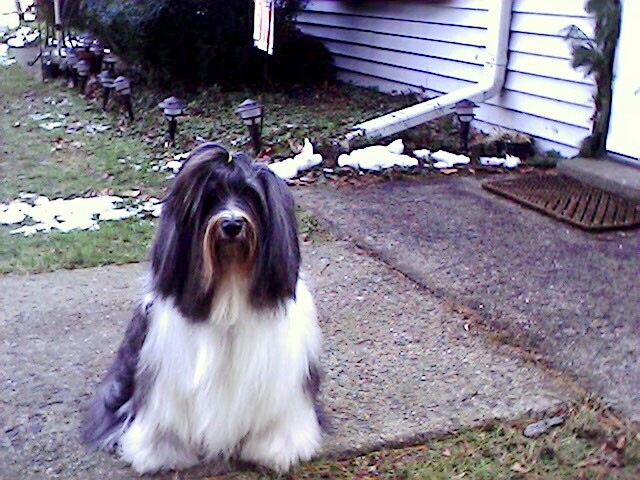 The copious double coat on a Tibetan Terrier covers the entire head and body and can be any color. They are well-balanced and square in proportion, with a compact body that makes them adept at endurance and speed. The Tibetan Terrier has large, dark eyes which are set far apart, and feathered, V-shaped ears which hang down on the sides of the head. Their large, round, flat feet are another distinctive feature as they aren’t commonly seen in dogs. The shape of their paws provide them with traction when walking on snow. The Tibetan Terrier is a gentle and friendly breed, and they are skilled at sensing and adapting their behavior to their surroundings. What does that mean? If they are inside the house, they will be calm and well mannered, but if it’s playtime in the yard, they are as playful and excitable as can be! The AKC describes the Tibetan Terrier as “affectionate, sensitive, clever, and vocal; TTs are like little people in dog suits.” Their ability to gauge situations makes them great for homes with children or other pets. Due to the sensitive nature of the Tibetan Terrier, calm, consistent training is favored over harsh or punishment-centered training. The Tibetan Terrier has one of the longest life expectancies, with an average lifespan of 15 to 17 years! 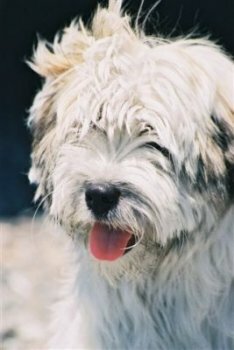 To find a Tibetan Terrier breeder in your area, check out our breed pages! Interested in learning more about Tibetan Terriers?CLICK HERE!